Would you speed up and run out on me? Oh I'm gonna try (to run faster) with a little help from my friends. I need somebody to run. I want somebody to run. Oh... I get by with a little help from my friends. Tumbleweed Running Club reunites after a bit of a hiatus ~ tomorrow morning, 6:45 am. I finally got out last night. 3 miles. Slow. No walking. It was good. No, it was great. It was the first *real* run I’ve had since Valley of the Sun, and it felt good be just be out (first and foremost) but it was also good to feel strong. I love runs where I feel strong. As I mentioned already, yesterday Micheline and I spent a long while on the telephone, combined with internet surfing, trying to find a race to run together sometime later this year. Our intent is to try and meet for a race once a year – following in the tradition of Big Sur. An interesting comment was made during our conversation, and I pondered it quite a bit last night during my run. Micheline knows me well enough ~ and may not even visit my blog enough ~ to know I didn’t take this comment the wrong way…so I’m okay with sharing it. As some background, Micheline is my pie-in-the-sky-friend. She truly believes that nothing is out of the realm of possibility. She isn’t deterred by physical or mental limitations; she’s ready to throw her hat in the ring for just about anything. She doesn’t share my disdain for the prospect of finishing last in a race ~ she’s all about just going for it. In some ways, I wish I was like that ~ but I’m much more conservative. So obviously we have some differences in opinions about the races we should consider ~ specifically given my adversion to HILLS. (Yes, we’ve covered that topic already, so it really needs no more explanation.) So in our search for suitable races, the degree of elevation change is an item for consideration. At least for me. And she got my point. I’m not about searching for easy ~ I’m searching for do-able. I’m searching for a race ~ and a distance ~ that I can conquer. 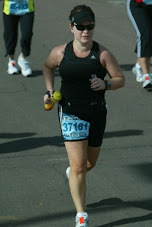 Up to now, for a variety of reasons, my first three half-marathons have conquered ME ~ not the other way around. I want to conquer a race. I want to conquer a distance. And then I can move on. And as I was running last night, I realized that is what makes me enjoy some runs more than others. When I am out there, running ~ feeling strong ~ conquering the distance, without it conquering me ~ I love the run. And as is human nature, when I am on the other end of the stick, I don’t feel quite as warm and fuzzy. There is something amazing for me about looking back at the completion of a run ~ whether it’s 3 miles or 13.1 miles ~ and knowing the distance didn’t defeat me. That was what last night was for me: 3 miles of Pokey versus the Pavement ~ and I came out strong and victorious. THAT is what keeps me running. And it gave me a new sense of focus. I’ve completed 3 HM’s lately, but I still have so much work to do. I have not yet conquered the half marathon. And I won’t move on until I do. My plan is to complete at least 2 more HM’s this year ~ and conquer the distance. To steal a phrase from Laura, this is seriously what I am becoming ~ a big, lazy lump of GOO. 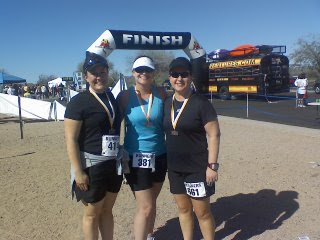 It’s sadly reminiscent of late 2006 after the completion of my very first *big race. 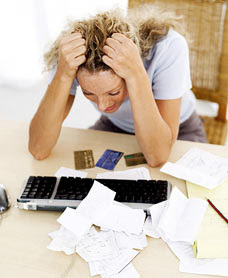 * I came home, with nothing on my plate to work toward, and became completely complacent. I stopped training, kept eating, gained weight and allowed my running progress to take a backward slide. When you’re a rookie, there is no such thing as a break from running. At least not for this rookie. So I’ve enlisted a bit of help from my friends today ~ Micheline and I spent 45 minutes on the phone this morning, trying to find some races to target for early summer or fall. I need to have a carrot dangling in front of me to keep me moving. I won’t allow myself a repeat of past years. 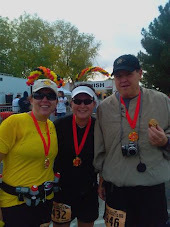 And in my final act of running desperation, I sent out a pleading email to some of my local running pals ~ Lisa, Pat and Eileen ~ begging for a 5 mile run this Saturday. It’s sad when Pokey ~ the once-upon-a-time-self-proclaimed-solo-runner ~ has to beg for a group run. So help me out, will ya running buddies? Don’t let this Pokey become a lump of goo. It ain’t pretty. I'm back ~ and still trying to get my brain unscrambled and some somewhat settled again after vacation......but thought I'd post a few pictures for starters. 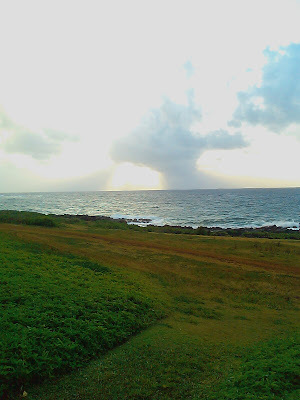 I only ran twice while in Kauai ~ the first morning and last morning ~ and tried to capture the amazing scenery as best as a cell phone camera can. But how can a run in these places be anything but great? Now back to reality. I'll get caught up with everyone soon! 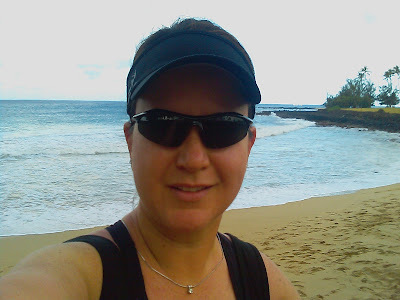 HAPPY, HAPPY TRI-ING to another one of my heros~ Nancy who is doing her first triathlon during my absence!!! Did you hear me ~ TRIATHLON!!! Holy smokes woman, you ROCK! HAPPY, HAPPY TRI-ING to Mendy & David ~ some veteran tri-do-ers~ who are great at just about everything! You guys make an awesome pair.....go ROCK that TRI on Saturday!! HAPPY, HAPPY HALF MARATHON to vivacious Viv ~ who is running a HM relay while I'm flying across the ocean ;) You are going to be fantastic! HAPPY, HAPPY, HAPPY MARATHON to Nat ~ who is running the Shamrock Marathon in VA Beach on Sunday! I've loved riding along the journey with you this far Nat.....so get your tail to that finish line, will ya? You're going to do AWESOME! I am looking forward to coming home to some GREAT race reports! ALOHA! Ahhhhh.....now isn't that so much better? 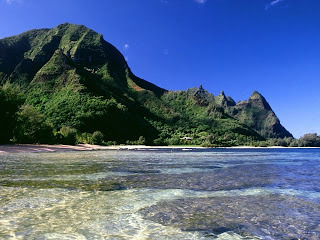 2 more days until we leave for Kauai, and I am just more than ready. Well, mentally ready - not ready, ready! Unfortunately, the laundry and packing fairy hasn't made it to my house just quite yet. 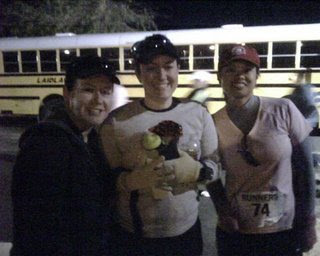 I'm still resting and recovering a bit from Valley of the Sun ~ I was extremely sore after this race (unlike the other two races where it didn't phase me a bit). Every part of my leg has been hurting ~ calves, shins, quads...the works. Today is the first day that everything actually feels back to normal. I have to admit that I was just a teeny, tiny bit relieved to know that Taryn shared some of my leg soreness after this race too ~ you know, it's the whole *misery loves company* thing ~ but it just made me feel not quite as bad :) (so thanks Taryn!) Of course, she happened to run this race in 2:13 and I ran it in.....well, you know. Enough said about that! I am enjoying the little rest from running though, particularly since my schedule this week is so crazy that it would have been hard to fit much in anyway. So it is nice to not have to worry about it. 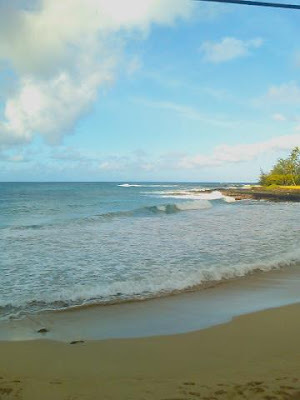 I'm hoping for a short run tomorrow night (Thursday) and then I'll pack up my running shoes and get some short runs done next week in Kauai. I so cannot wait! One year ago today, I lost one of the most important people in my life ~ my dear Gram. But one loss, is another gain ~ and I know there are many people, both living and deceased whose lives are much better today as a result of my Gram and her amazing life. You won’t ever hear me say the words “rest in peace” ~ on the contrary, I hope that my Gram is having the best time of her life. Picked Lisa up at 5am. UGH. Coffee. PB&J Sandwich. Whining. Driving. Analyzing. Strategizing. Contemplating. Wondering why we didn’t pick a different sport. 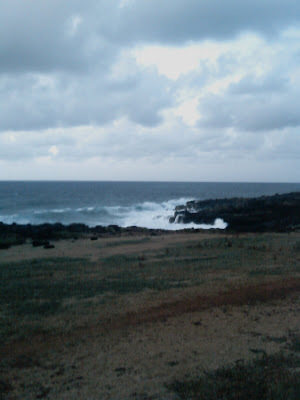 That was the drive to the race – some 40 miles away. It took us 50 minutes to get to the location, when we planned on 30. Talked to Taryn. Met up with Eileen, who was hopefully not discouraged by our bad behavior on race morning, LOL. We hopped on the shuttle to the staring line, and compulsively analyzed our Garmins, making sure they were set appropriately – mine with intervals, Lisa’s with Trainer Guy. Done. Got to the finish in the perfect amount of time. Said a quick hello to Taryn again. Headed for the starting line (which ended up being about ¼ mile from where we thought it was). We took off in perfect form. Words were spoken that had never been heard on a run with Pokey and Java ~ words like “we need to slow down” and “I think you’re running too fast again.” And we were ~ we had to consciously work to stay ahead of Trainer Guy – but not too far ahead. We both learned lessons at RNR about coming out of the gate way too fast. Miles 1 and 2 were great – some of the best miles I’ve run. Breathing was hard for both of us, but it was all about the warm up stage. The first hill surprise came sooner that expected – somewhere between mile 2 and 3. So we walked ~ a lot. 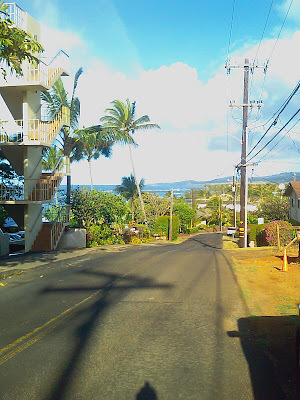 I was continually amazed at how much energy is expended on hill running, or even hill-walking. It zapped a lot of my energy way too early on, but we trudged on. While pushing up the hill, we looked for Eileen at the relay station, but missed her. Taryn came up behind us, we commiserated about the hill for a bit, and then she took off. We had her in sight for a while, but not long. Way to rock, Taryn!! This is where the race starts to get blurry for me. I remember miles 3-6 as being okay ~ but I was hot. The sun had come up over the mountains and it was blazing - at least to me. 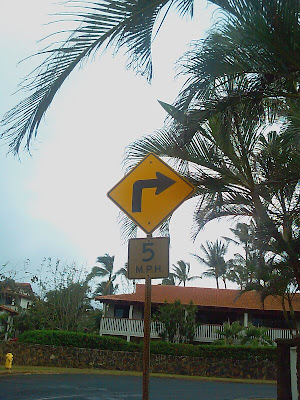 Luckily we were on a nice grade at this point, and we still kept pace. At just about the 10k mark, we made a turn back onto Bush Highway and this is where the real fun for me began. At the 10K aid station, we were still on track…a bit ahead of pace. Trust me, my running partner not only had Training Guy on her wrist, but the split breakdown on a piece of paper in her pocket. Would you expect anything less? We made a few "aquaintances" along the way ~ one in particular who stayed neck and neck with us, and had to put up with our comic relief efforts. At the top of the large downhill, we apologized to her for having to listen to us. She laughed and said that she wished she had a running buddy like that to joke with. We invited her to run with us, but somehow she thought she wasn’t fast enough. Silly girl ~ she apparently hadn’t been listening to our conversations well enough. Then at the 10 mile aid station, a worker asked us if we were twins! We laughed – and I said no, we just dress alike. But it made me wonder if running partners are like spouses ~ you know, the longer you run together, the more you look similar? Hmmmm….. So amid all the joking and Laverne & Shirley antics, it still happened. My 10 Mile CRASH. Yup, I’m a crasher. I have 3 races under my belt to prove it now. We were still on pace at the 10 mile mark, until my legs had just reached their max. No real cramping, but the tightness was almost unbearable. I know a lot was related to the hills ~ but a lot of it is just the norm for me also. 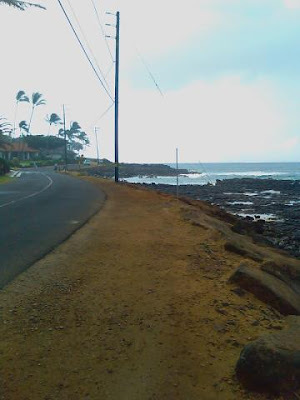 My energy was zapped and my legs were screaming – and we still had some miles to go on an incline. Not good. “You didn’t come all this way to walk the last 2 miles!! !” I tried to explain to her that yes, really….I did….but she wouldn’t have it. There would be no loafing for Pokey. She bumped our intervals to 1 minute just to keep me moving. I asked again for the millionth time for her to go on ahead and get her new PR ~ it was still totally in reach if she ditched her baggage. Of course, she refused. She made a comment about what a lousy friend she would be if she left me behind. I tried to explain that I thought racing wasn’t about friendship ~ it was about running. But she didn’t buy that one either. My trusty running partner somehow got me and my tired legs across that finish line at my best time ever. It’s hard for me to not let my mind wander to what our race could have been, if it had been a flat course like RNR. I know we would have hit our goal –and then some. But it wasn’t RNR, it was Valley of the Sun and it had its challenges. We faced them one at a time, and got through. Overall, I guess my legs held up okay (better than before) ~ I had a serious cramp issue at the car (more on that later), but ultimately, I was just pretty tired. Lisa finished strong, with plenty of fuel left in her tank ~ which is a tribute to all the work she has done. KUDOS to my running buddy! I’m bummed that running season is pretty much over for us ~ I have so many thoughts of what we could do now, that it’s hard not to be bothered by it. But I’ve already done more than I ever thought ~ 3 half marathons in the past 5 months, each of them with their challenges, lessons learned, and more success than the one preceding. I really have no room to complain. Lisa, thanks so much for a GREAT run! Out of a molehill? No, really ~ I’m not. I would hate for others to think I am obsessed (cough, cough) about the HM this Sunday, cause I’m not. I am also hoping to meet up with Eileen (Running Knitter) sometime before the race (she won’t like me if we meet after the race), as she is running the half-marathon relay. Also, Taryn is coming to town with her new-running-buddy ~ so I’m excited about seeing her too! In other miscellaneous ramblings, I am finally down 4.5 pounds!!!! This seemingly harmless contraption, when dripping in bubble soap and in the hands of a 3 1/2 year old, is able to take a chunk of human hair, and within nanoseconds, turn it into a dredlock-like state, which also resembles a hair ball that a cat might deposit on your carpet. Once this hairball is hanging from your head, and you are past the initial shock, you must use scissors to cut a chunk out of your hair, much like in your grade school days when a piece of bubble gum went astray. Then you are left with a bad haircut, and soapy hairball, and if you’re like me and freak out and lose your shizznit ~ a crying child. 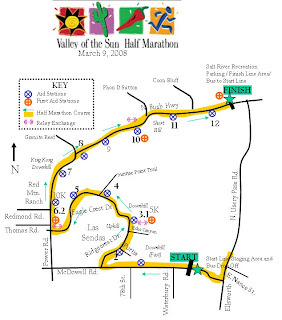 Thanks for all the words of wisdom regarding the course elevation for Valley of the Sun ~ it helped me get my mind around it a bit more. I'm with Jeff ~ being an AZ girl, flat is where it's at for me too :) It makes Micheline crazy that I consider running up my driveway as *hill work*.....but maybe she'd be impressed with the curb-work that Lisa and I do as our hill training? Going up and down curbs can be hard work ;) Apparently some people just don't get it. I'm kind of excited about this run in a strange way ~ I'm not as well trained as I was for RNR, but for some reason I feel good. I feel strong. And it feels great! Oh yeah ~ the Word Cloud idea over there --------> was stolen from Viv ~ what a cool idea! It's interesting what words repeat in my blog all too often. I like it....it's kind of an at-a-glance version of who I am and what is important to me ~ running wise. Cool. Brutal? Or a cake walk? 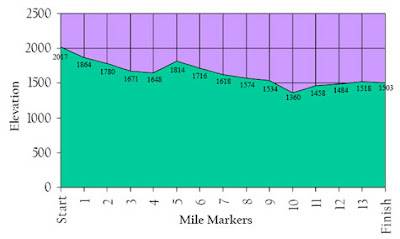 It's the course elevation chart for the Valley of the Sun this weekend ~ and I was pretty comfy with it until yesterday. Lisa's super speedy runner friend ~ the one who kicked my tail for 6 miles a few months back ~ was shocked that we were running this thing ~ calling it one of the hardest half marathons she has done!!!! YIKES. But since it's too late to be nervous about it, now I am just curious. To me it looks mostly downhill, with a few small inclines. I guess I have a hard time intepreting what 100-150 foot elevation change really means when spread out over a mile. Am I underestimating these inclines? The Valley of the Sun Half Marathon is a week from tomorrow, so today was the last long run of training. There were 6 miles on the schedule that Lisa developed for us. Sadly, the TRC wasn't able to meet together for this training run :( So I braved the big, bad pavement on my own. My mental plan was to run ~ continously ~ the first 3 miles, and then do some intervals for the remaining 3. It is always a wonderful feeling when you realize that training is starting to pay off ~ because I still felt GREAT after 3 miles. I slowed my pace to a very slow, comfortable jog......but only stopped when stop lights dictated. I ran a nice, 6 mile loop around my area ~ even past Lisa's house where I yelled at the top of my lungs " Javaaaaaaaaaaaaaaaaaa!!!!" It was a BEEEE.U.T.FUL run!!! I felt strong the entire way. At one point I looked at Garmie, saw my pace, scowled at the data, and then literally said outloud to myself: "It's okay." It is okay for me to run a 12:30 pace for an entire 6.45 miles. And actually, it was BETTER than okay! Legs felt good. Breathing felt good. Hydration was good. Fuel was good. Everything was GOOD. Today is just a GOOD, GOOD day! And plenty of (((((GOOD LUCK))))) vibes going out to all those who are racing this weekend ~ Jeff, Viv, Pat (possibly), Mendy.....and anyone else I may have spaced on :) Hurry up with those race reports!! !